Announcing the newest addition to the Engineer Master II family: DLC. This stunning watch features a high-polished black DLC (diamond-like carbon) 41mm stainless steel case with a screwed-in crown and sapphire crystal. The DLC is built on an automatic movement with day and date indicator, has 51 micro gas tubes illuminating the dials and hands, and features a black concentric dial with either yellow or blue accents. At BALL Watch, innovation and creativity are the cornerstones on the foundation of our corporate mission, "Accuracy Under Adverse Conditions". Continuing in the tradition of Webster Clay Ball, BALL Watch aspires to manufacture the most accurate mechanical watches on the planet, ruggedized for use by those that live / work / play in truly adverse conditions. With unlimited inspiration, BALL is today setting the standards just as Webster Clay Ball did in the late 1800s and through the early 1900s. 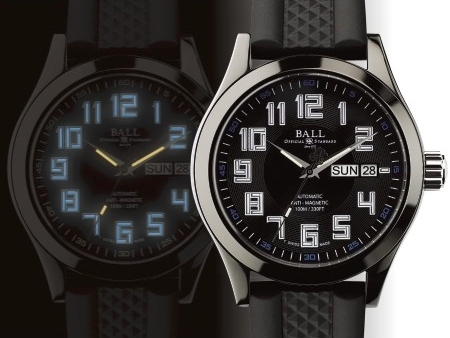 All BALL Watches are equipped with patented, BALL-engineered self-powered micro gas light technology that light up brightly for at least 25 years. Other innovations of BALL are a 7,500 G force shock resistance, the -40 degree Celsius temperature rating, and a patented crown protection system.